(04-14-2019, 12:18 AM)Deepsouthlady Wrote: Okm we just hit basement. Confirmed on the ground. Heading right towards me. We also just lost power. Deepsouthlady, Moon Rocks likes this! Deepsouthlady, Mmmmkay_Ultra, Moon Rocks, Sassy likes this! The TV weather guy was just showing potential "spin up" map for the region and it gets crazy widespread all over Ga but especially South and East/N East..
Deepsouthlady, Moon Rocks, MysticPizza, Sassy likes this! Our radar shows a strong band in the foothills. I don't watch the news so haven't been subjected to any fear mongering but still going to prepare for the worst. (04-14-2019, 08:28 AM)MysticPizza Wrote: Heading our way this afternoon. I wonder if the mountains will break the system up. Half of the time it does. Lost power here about 3:15 PM. Standby generator doing it's thing. Deepsouthlady, Karu, Verity likes this! 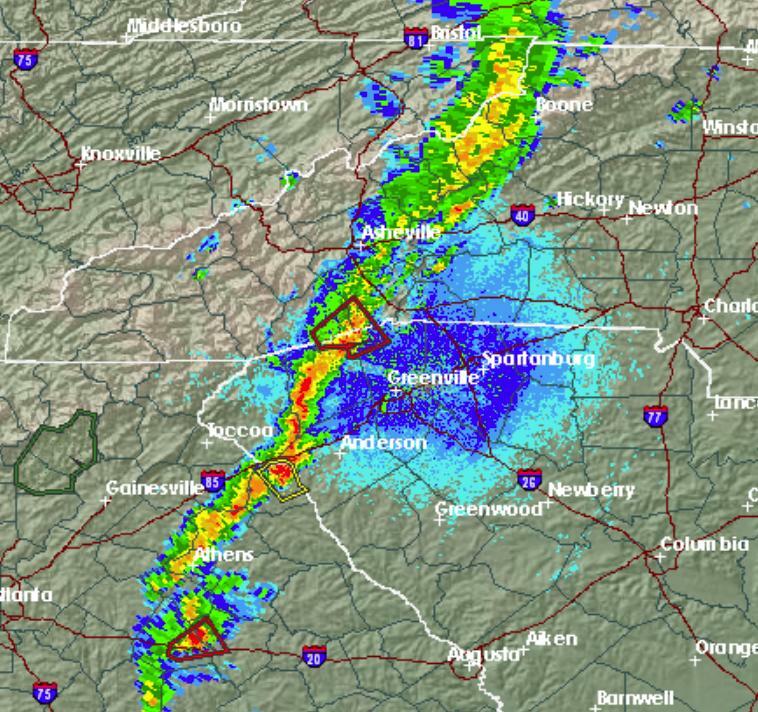 Tornado warning moving into NC right now..south of Asheville..
@MysticPizza " where r u? I agree usually the mountains will break these storms up. Its kinda like me. We dont worry til it crosses the MS river. Sometimes it breaks it up and sometimes it gives it fuel. It seems most of tornadoes here went through farmland or swamp areas. God is good! mountain man, MysticPizza likes this!